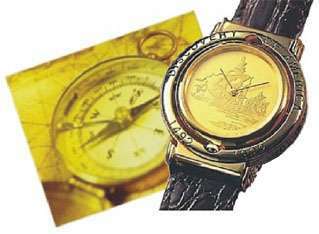 "The Great Golden Voyage" was the name given to the edition of only 2,500 watches produced and sold in Japan by IEI. This remarkable watch was designed as a two-time zone watch with a unique system of working the watch. The Discovery of America watch is commemorative of the world's greatest discovery when Christopher Columbus found that the globe was shaped like a ball and sailed the three ships across the ocean to discover America over 500 years ago. The outside of the 22k gold tone case is embossed with the lettering of Discovery of America and the dates 1492 to 1992 which depicts the 500th anniversary of the famous voyage by Christopher Columbus in the year 1492. The two time zone 22k gold tone case contains two Swiss quartz movements. One side contains a Swiss quartz movement with a date function. The other side contains a regular Swiss quartz movement with a 22k finish embossed dial design of the three ships that sailed with Columbus on his voyage to America�the Nina, Pinta and Santa Maria. The back of the watch case is etched with the certification of the American Geographical Society commemorating the 500th anniversary of the discovery of America. Inside the watch case of the Discovery of America watch is the globe and compass emblem of the American Geographical Society. The watch strap has a crocodile design produced in fine quality Italian genuine leather. With the flip of the finger, you can easily access either one of the two time zone movements. The watch is packaged in an attractive high quality aged teak wood box lacquered with 15 coats of high gloss polyurethane with a rich color stain and pearlized leatherette interior. The Rich Collection provides a ten year warrantee on the Swiss quartz watch movements. At the time the Discovery of America watch was issued in 1993 by IEI in Japan, the watch sold for the equivalent of $750 American dollars. The Rich Company designed and manufactured the Discovery of America watch for IEI with the consent of the American Geographical Society. Currently there is a limited amount of Discovery of America watches that are available through Rich Company. This watch is sold exclusively on the Internet for a special price of $375.00. When you wear this exquisite men's watch, choose the side for the time zone you desire. The Discovery of America watch has a simple and elegant look and will be the foremost watch in your life. If you wish more information about the Discovery of America Two Time Zone Watch since there is only a limited supply available, feel free to e-mail at info@richcompany.com, and our staff will be pleased to assist you with your order.